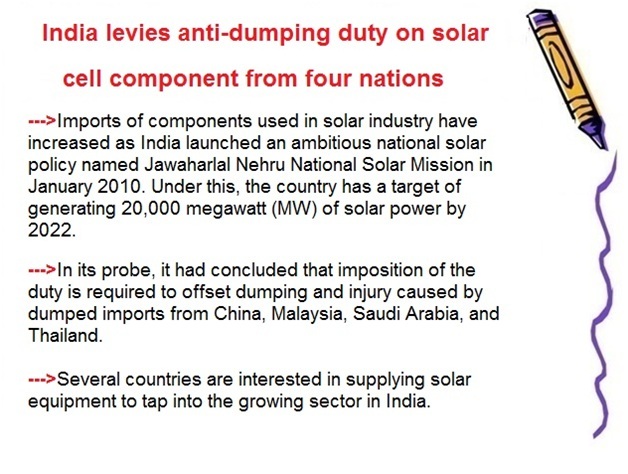 ﻿ India levies anti-dumping duty on solar cell component from four nations. India levies anti-dumping duty on solar cell component from four nations. In a notification, the Department of Revenue has said that after considering the recommendations of the commerce ministry's investigation arm DGTR, it is imposing the duty. India has imposed anti-dumping duty of up to USD 1,559 per tonne on imports of a certain type of sheet used in solar cell making from China, Malaysia, Saudi Arabia and Thailand for five years to safeguard domestic players against cheap shipments. In a notification, the Department of Revenue has said that after considering the recommendations of the commerce ministry's investigation arm DGTR, it is imposing the duty, which is in the range of USD 537 to USD 1,559 per tonne, on imports of "Ethylene Vinyl Acetate sheet for solar module" being exported by these four nations. Imports of the sheets from these countries increased to 6,367 tonne during the period of investigation (October 2016 to September 2017) from 4,674 tonne in 2016-17. The imports stood at USD 1,025 tonnes in 2015-16 and USD 594 tonnes in 2014-15.